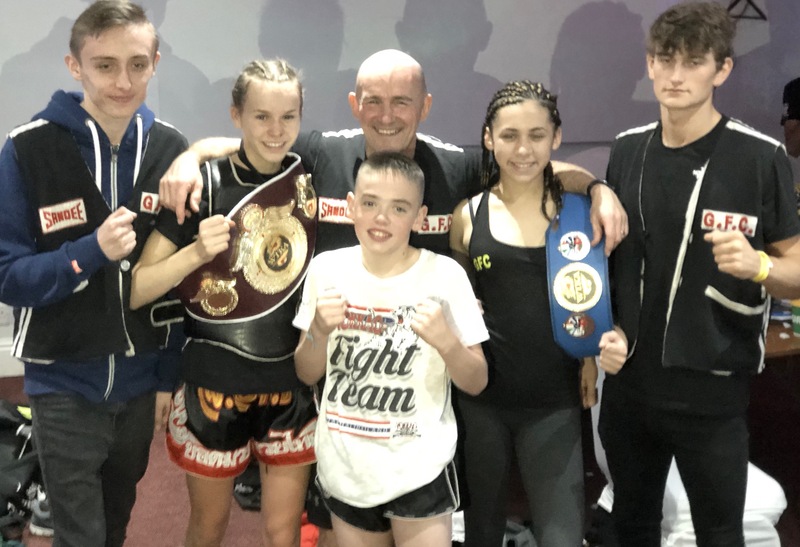 It’s been a busy September for local Thai Boxers from the GFC Gym in Bury. 11thSept saw two members Lewis Bentley and Ella Thompstone, both students of St Gabriel’s high school, competing in Scotland. There was initial disappointment as both their opponents came in overweight, but not wanting the trip to be for nothing, they both decided to fight anyway. First up was Lewis who showed all the skill and ability that has made him two times European champion in picking up a unanimous decision in a performance that once again earned rave reviews. Martin Jones of Origin Media, who photographs 80% of the Thai shows in the Country, stating, “every time is see this kid fight I am convinced he will be world champion, so cool and clinical with all the time in the world to deliver his shots.”. Next up Ella, who again dominated from the start consistently changing styles throughout the fight to pick up another landslide points victory. In another endorsement, Paul Spinks one of the countries busiest referees stated on his Social Media, “I don’t know what GFC do with these kids but every last one is amazing”. Just three weeks later four of the gym fighters travelled to Birmingham. First up Anthony Hamer took a points victory in a see saw battle. Next up the gym’s other two times European champion, Lewis George proved way too strong for his French opponent, stopping him in the 5thround. Third up for the gym, Was Kellisha Dodds. Kellisha wasn’t supposed to be competing on this show and had actually had some time off ill, yet on Thursday night we got a call to say one of the girls competing for a European title had to withdraw so “would Kellisha take the fight?”. It took Kellisha about two seconds to give a very firm “YES”. The first three rounds were close but probably had Kellisha just ahead, despite fighting the French 7 x national champion, shower her class Kellisha the last two rounds to win unanimous and become new European champion. In doing so she joins her gym mates; Lewis George Lewis Bentley and Mackenzie Roberts in winning European titles this year. Last up was Ella Thompstone again, in her 8thfight this year, after having her first fight in Nov Last year. Ella would be competing for her first British title. Her opponent had twice as many fights as Ella and showed her experience in not allowing Ella to totally dominate has she pretty much had in all her previous fights. Ella was still to strong and once again came out a unanimous points winner. Martin Jones again commented, four fighters Four class performances, four wins, is there anything GFC can’t do?” There was more praise when Dean James, four times world champion stated on his social media, “Such a strong team, its pleasure to watch them do their stuff”. Final third of the year. It’s going to be a busy last third of the year for the gym and it has three adults fighting 13thOctober in the biggest Muay Thai Show outside of Thailand at the Macron stadium in Bolton. Three juniors competing in the unified world champs in Italy at the end of October and then hopefully nine fighters competing in Barnsley on the 18thNovember. « GFC Fighters set to fight on Europe’s biggest Muay Thai show!